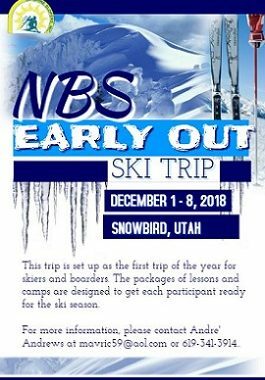 This trip, in Snowbird, Utah, is set up as the first trip of the year for skiers and boarders. The packages of lessons and camps are designed to get each participant ready for the ski season. The trip offers a complimentary Never Ever package for 1st time skiers and snowboarders. The package includes a free 2 or 3-day lesson, equipment rental, and lift tickets. The trip also offers discount early season lodging rates. For more information contact Andre’ Andrews at marvic59@aol.com or 619-341-3914.